OMG there was sooo much stuff in store today I can’t even remember all of it. I just went wild. 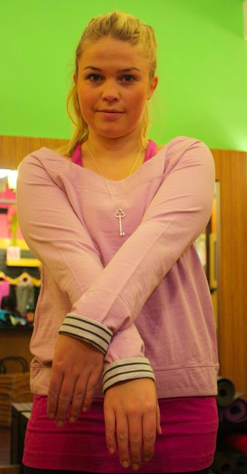 I tried on the Violaceous swiftly tech long sleeve and the Iris/light Grey baseball Swiftly Tech long sleeve (they also had them both in short sleeve) and really loved it as well but it was too form fitting around the tummy in the size 6 so I passed for now They got so much product today that they couldn’t put all sizes out. There were Lively Crew Neck Tee’s in Snorkel and in Violaceous, a White In Stride with the logo in Unicorn Tears, Pacesetter Pullovers in Snorkel and Iris, Pacesetter Crops in Black with Unicorn Tears waist. 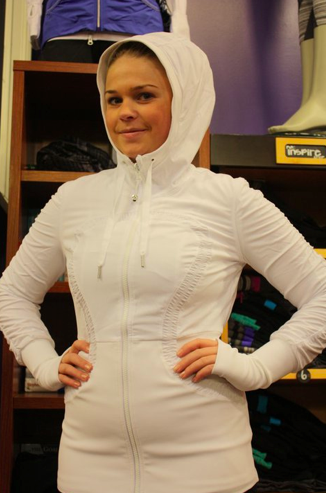 Scuba Hoodie in Unicorn Tears, Dance Studio Jackets in White, Black and Coal, Run Energy Short Sleeve in Violaceous. No Show socks!! But I didn’t end up getting the socks because I’m now a convert to wool socks and wash and hang to dry immediately after running so that I can use them again for my next run. Aura Jacket TTS (size 8) fitted in the arms. I really didn’t plan on falling in love with the Aura Jacket but alas they had to make it in pretty pink Iris and that was all it took. I love the off the shoulder ginormous hood, it really gives it a pretty flashdance type of look. 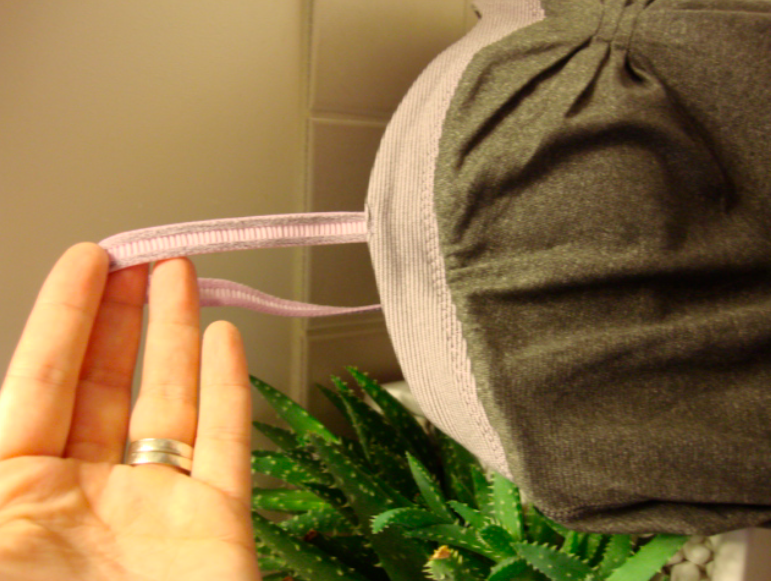 The hood ties have reversible holes to weave the ties through to the other side. The zipper is sadly metal but it does look good on the jacket. The things I’m sort of meh about is the logo. it’s slightly bigger and silk screened on just like the Effortless Pullover was. The lower arms are indeed ruched and there are thumbholes. 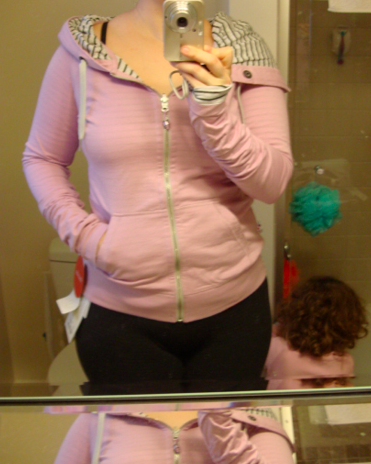 Other then that this jacket is adorable and looks fantastic on me if I do say so myself. 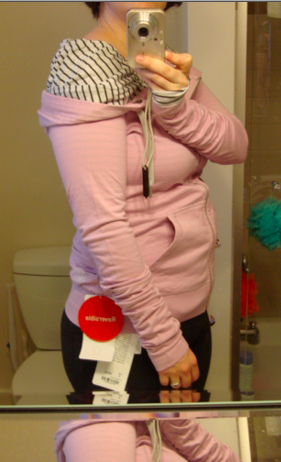 This was sort of cute but was in between being a sweater and a sweatshirt as far as fabric weight. Next to the Aura Jacket this one is pretty plain. Modern Racer Tank in Heathered Iris (wee stripe?). I love this tank. I got it in a 6 because that’s all they received today was one 4 and two 6’s so I grabbed it but may exchange tomorrow for the 8. 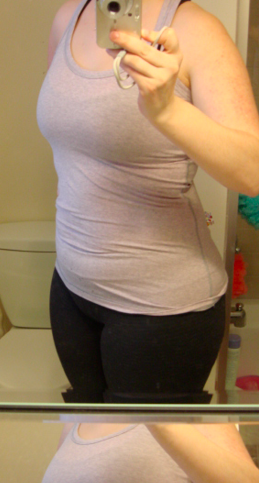 I like size 6 in my tee’s but somehow in a tank I prefer it to be slightly slouchier. A detail shot of the heathered iris wee stripe contrast. 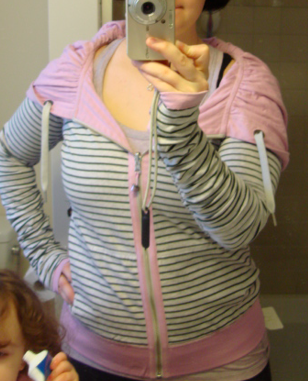 I got this tank today in Black and this Wren/Heathered Iris Wee Stripe and I adore it. My only issue with the fit was slight armpit fat over the top sides but if you adjust the tank so the top of the bust sits higher then it eliminates the armpit fat issue. I really love this tank!!! All of the Pure Focus Tanks on the tank wall were already loaded with bra cookies so that was a very nice bonus. I didn’t try this one on today and I never did see it when it was out a few years ago so I can’t compare but I did like it. It’s Swiftly on the outside with Luon on the inside and it has some ruched detailing at the front logo which may be sheer luon. I think I saw it in Black and Coal but I’m not positive. This was a really cute tank. The top bust portion is made of luxtreme and the entire bottom portion is circle mesh with a little cinch cord at the bottom. This is a shelfless singlet tank that you would use your own bra with. "“Our Hearts Go Out to Bethesda”"